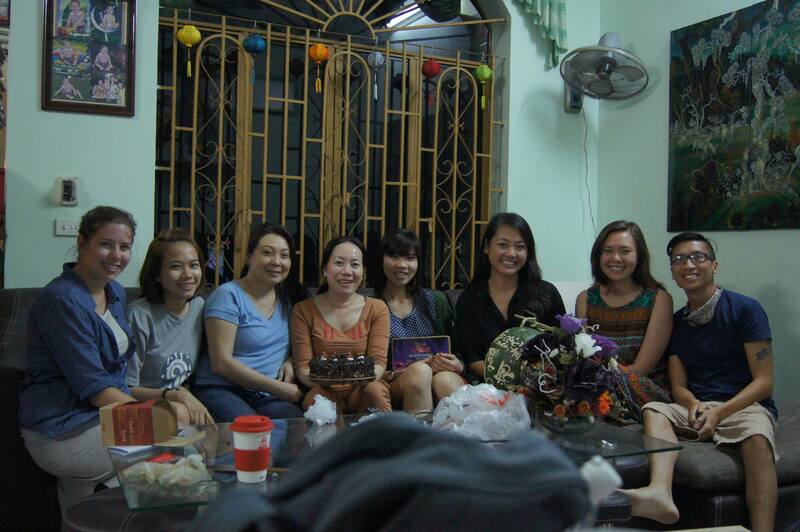 After returning from Guam it was time for Vietnam’s biggest holiday: Tết. 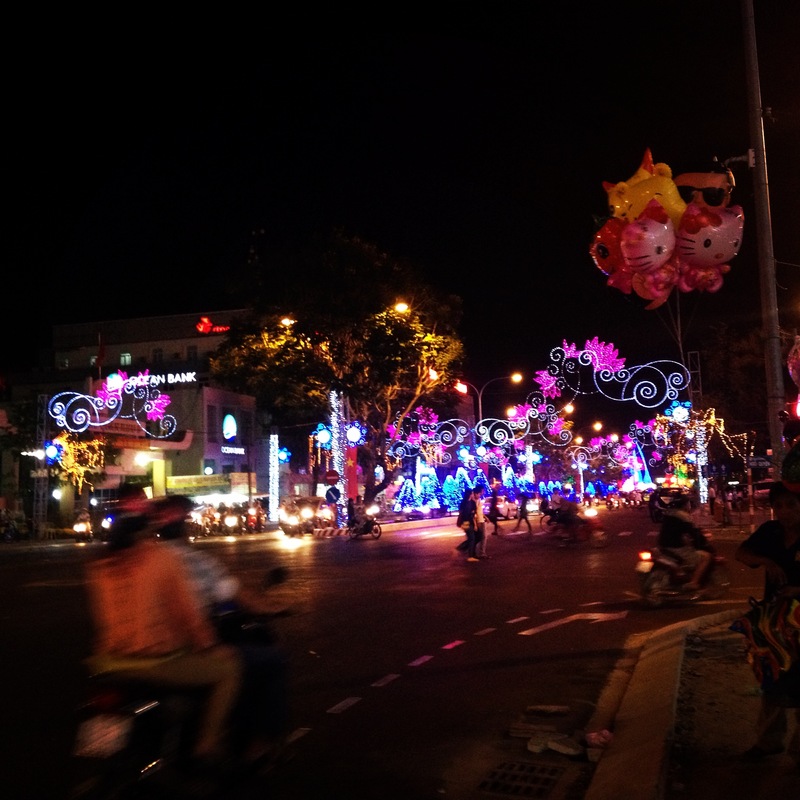 Tết is the Vietnamese celebration of the lunar new year, and is celebrated anywhere from 3-14 days. If you were to compare it to an American holiday, it would be something like Thanksgiving and Christmas combined. Everyone goes back to their hometowns to spend time with their families and ring in the new year by cleaning, buying new clothes, and visiting friends and neighbors. In the weeks leading up to the holiday I watched as Cần Thơ transformed in preparation for the holiday. While christmas-style lights had been up since December, February saw flower markets spring up all over the city. Apricot blossoms are the symbol of Tết, and they were suddenly everywhere. It was beautiful to see, and as more and more decorations went up, I got more and more excited for my holiday plans. While most Vietnamese go home to visit family, I had just seen my parents in January, and had made plans to spend most of the holiday traveling on my own, which was looking a bit lonely. Luckily for me, right before Tết my uncle Brad came to visit, and I was able to show him around my new home in all of its decorated glory. 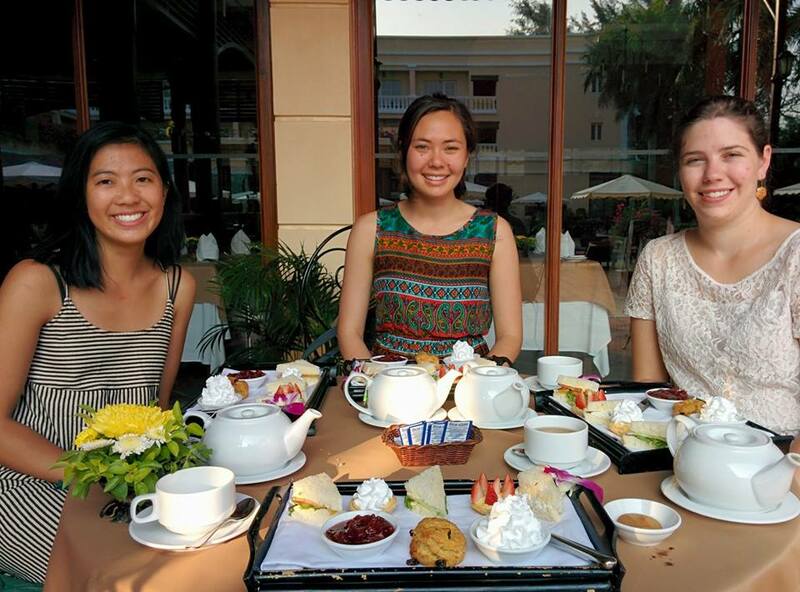 We rode bikes, ate in my favorite restaurants, did a bit of walking around the city center and even went to high tea. It was really good to see family, and it was fun to host my first (and possibly only) visitor. Thanks again, Brad! High tea with family and friends (Brad’s on the other side of the camera). 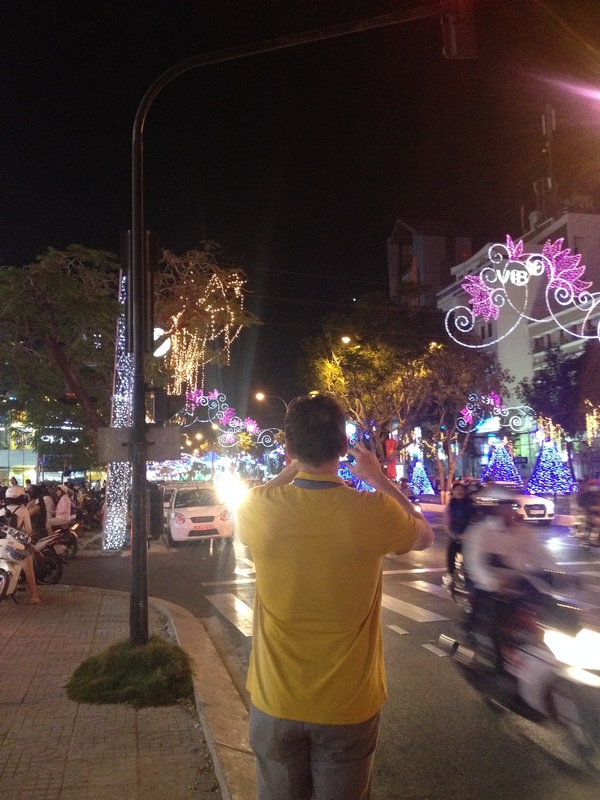 Right after Brad’s visit my holiday truly began with a 6-hour bus to Vũng Tàu with friends. My housemate, Peter, had invited us to spend a few days with his family and hang out at the beach. 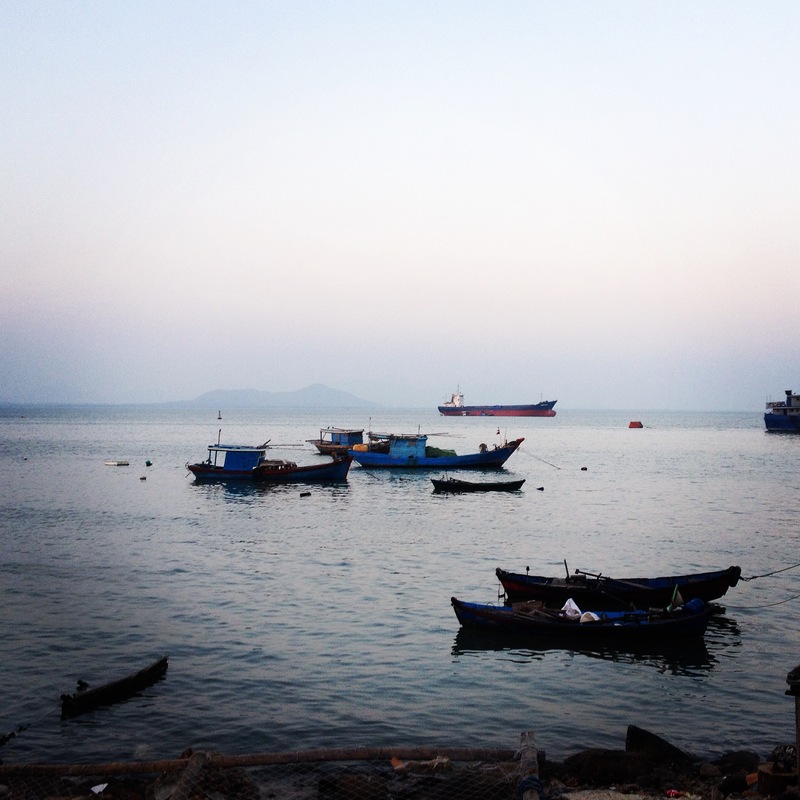 We hopped on a sleeper bus Saturday morning and, after taking full advantage of the reclined seat/beds (and the delicious pancakes sold at the rest stop), arrived in Vũng Tàu in the late afternoon. We all set our stuff down at Peter’s family’s house, then took a walk out of town and by the water to get a feel for our surroundings. I guess we walked in the right direction, since we had a nice view of the sunset over the ocean. After a while we realized that it was getting late and went back to the house for a delicious seafood dinner with Peter’s family. After dinner another friend arrived, and we all went out for bubble tea, which was probably the clumsiest evening I have had in years. The tapioca “bubbles” were too big for the straws, and so they would get stuck as we drank. One by one we all had this happen, then attempted to pull the straw out and get the “bubble” off of the end, while simultaneously spilling tea all over ourselves and the table. It was like something out of a comic skit, as we would laugh at one person and then turn around and do the same exact thing. We went home with sides that hurt from laughing and hands sticky from bubble tea. 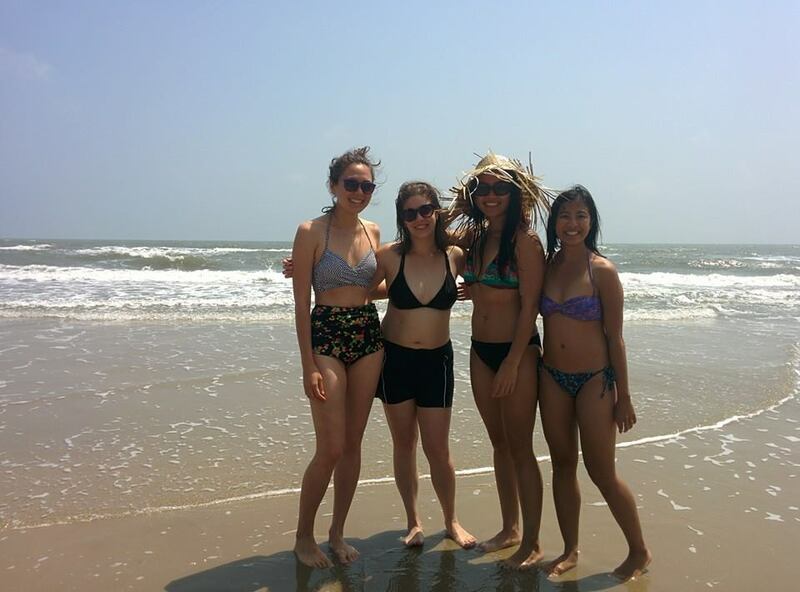 The next day was our beach day, and we went all out. It took maybe 15-20 minutes by taxi to get to the nice beach, and we walked a ways before staking our claim to a stretch of clean sand. I had brought along a book and had intended to spend most of the day reading under an umbrella, since I’m not a big swimmer, but as the day went on I found myself jumping in and having a lot of fun. We spent the entire day by the water, swimming, eating ice cream and taking tons of ridiculous photos. We buried one person in the sand, and I even took a stab at making a sand-sculpture. Yes, it was a sand manatee. 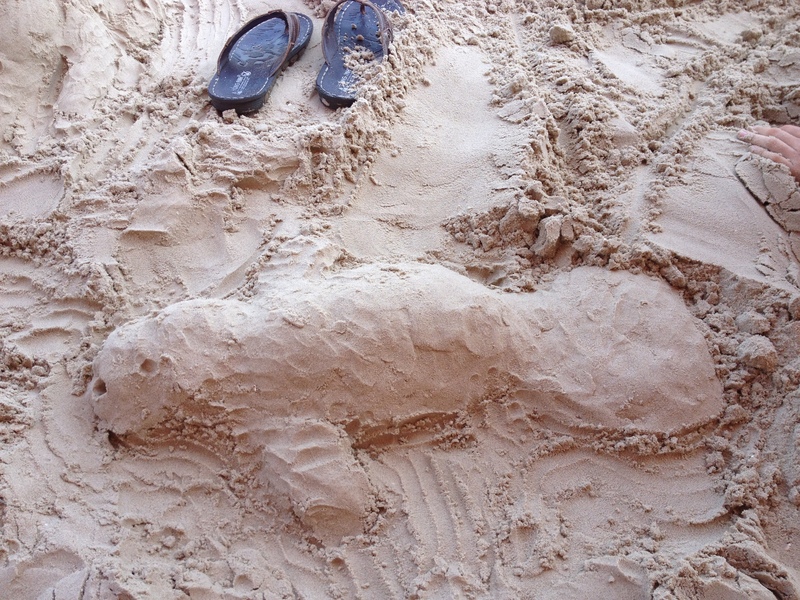 What else would I make but a sand manatee? The next day our numbers began to dwindle. Selina and her friends from the US had to catch a 6am bus back to Tra Vinh, and they had to be at the bus station by 3am to ensure that they could get a seat (they don’t do reservations and every type of travel was crowded for the holiday), so when I woke up they were already long gone. Everyone was moving slowly that morning, and I was a bit burnt after a day in the sun, so we decided against going back to the beach and instead went out for coffee. Peter and Marc hung back and stayed at the house, so I spent a few hours sipping coffee, eating banh mi and talking with Laura and Hang. I can’t exactly say why, but I think this was one of my favorite parts of the entire trip, just hanging out and talking with friends. By the time Peter and Marc met up with us it was already time for lunch, and we were treated to another delicious home-cooked meal with Peter’s family. In the afternoon Marc took off for the airport, and the remaining four of us decided to go to the city center and find a gift to give Peter’s family for letting us stay with them. We ended up at the local Lotte Mart and ate a super healthy lunch of KFC and pastries, caught an afternoon movie, and then bought a cake as our gift. When we got back to the house and gave Peter’s family the cake, we learned that it was actually his aunt’s birthday, and so the cake was super appropriate. 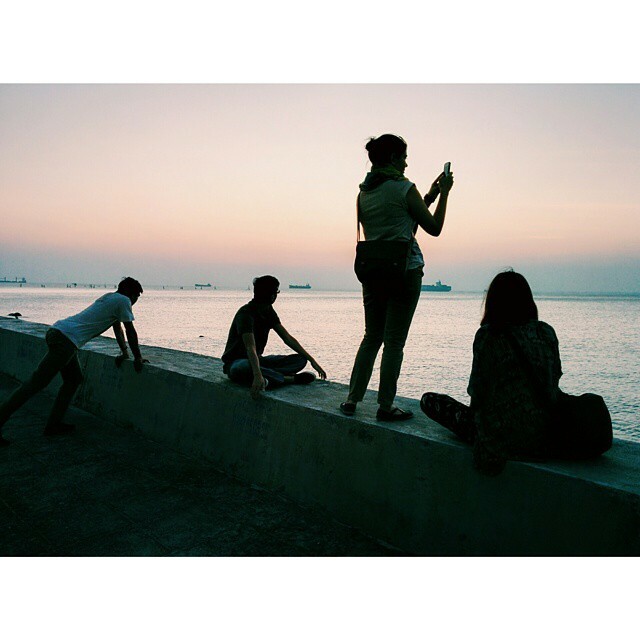 The next day was our last day in Vũng Tàu, and we decided to once again have a lazy morning at a nearby coffee shop, where Laura, Hang and I planned out an extravagant evening in Ho Chi Minh City, where we were all headed that night before going our separate ways. 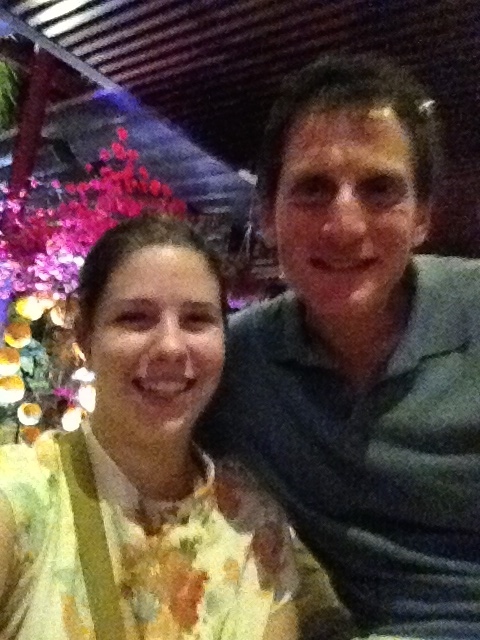 We had one last meal with Peter’s family and then caught a bus into HCMC. After dropping stuff off at the hotel we went out in search of our chosen restaurant. After sitting in traffic for a while we made it to the restaurant only to learn that it was closed for the holiday. So we then took off on foot for plan b, which was also closed. We walked around from place to place only to find that all of the places we had planned on were closed, all of our second and third and fourth choices were also closed, and eventually we ended up walking all the way back to the backpacker district, where we had halfway decent (by Vietnamese standards) Mexican food. The night sounds like a disaster on paper but it was actually a funny adventure, going from place to place only to end up back where we had started. It seemed like a good way to end the first leg of my holiday before setting off on my own. The next day I embarked on my first true solo vacation, four days of shopping, sightseeing and drag queens in Singapore, but that’s a story for next time. After I returned to Vietnam from my winter travels I found out that I had the opportunity to go to Guam. Now, I really wish I could tell you more, but I signed a nondisclosure agreement and sadly can’t say too much until May. 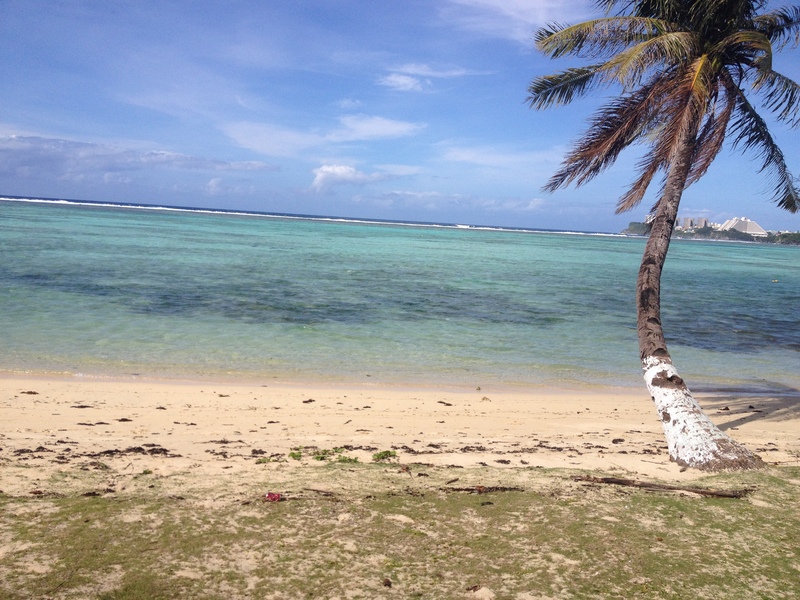 In any event, I spent a very short, very pretty time in Guam. Now, in case you were wondering, Guam is a US territory in the South Pacific, and is part of the Mariana Islands. All I knew about Guam before I went was that it had a military base and that it played a part in WWII. Both of these are true, but there’s a lot more to the Island than a military base. In terms of tourism, it’s become a bit of a shopping destination for Japanese looking to go to the US, but who would rather not travel as far as Hawaii. 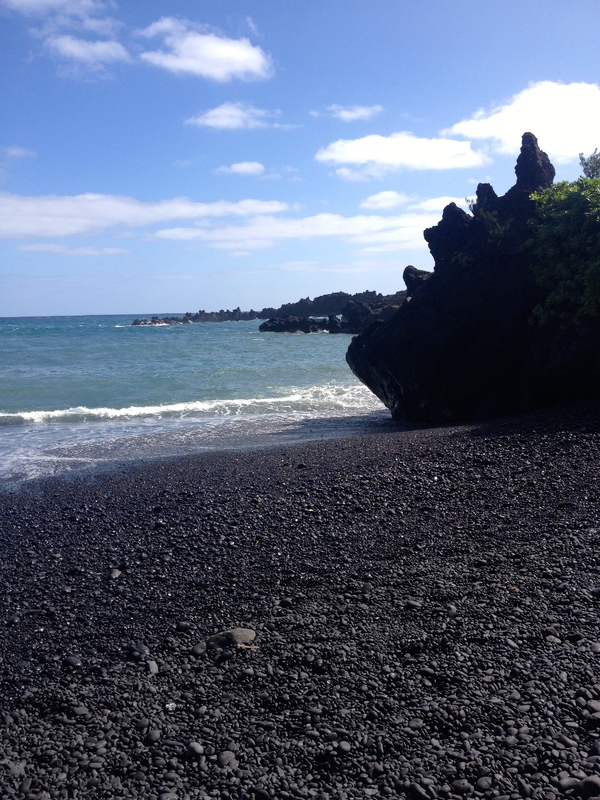 It’s also got some gorgeous beaches, an interesting history long before it became a US territory, and a few cafes that can make a mean pumpkin cheesecake. My visit was extremely short – I arrived at 4am on Thursday and left at 2am Saturday morning – so I didn’t get much of a chance to explore. But, since I can’t really talk about why I was there, for now I’ll just post a few pictures I took while wandering around, and hopefully I’ll be able to say more soon. Flying home through Seoul meant a trip to the Hello Kitty Cafe (a new addition to the international terminal that I highly recommend). This is a sweet potato latte, and it’s delicious! And, for good measure, here’s a video from Last Week Tonight with John Oliver about the US Territories. I had no idea this was the case when I was there, but… wow. Citizens of US Territories are not allowed to vote. It’s 2015, this should no longer be the case. Take a few minutes to check out the video – it’s long, and it’s clearly a comedy show, but it’s pretty interesting. This past fall the Clayton High School class of 2009 held a 5-year reunion. I did not attend, what with living in Vietnam and all, but I was still pretty surprised that enough time had passed for there to be a reunion. Was I really that far out of high school? 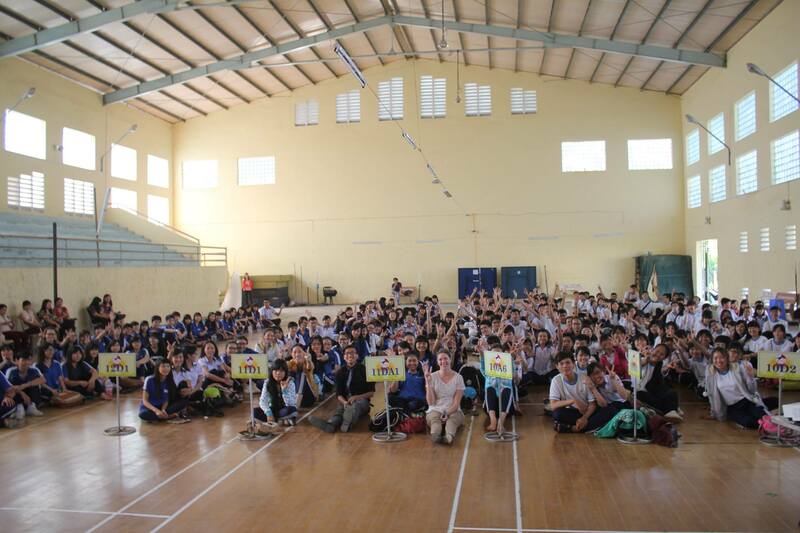 Well, after a weekend spent teaching high school students in Sóc Trăng, let me tell you, the answer is yes. 110% yes. When I returned from my winter travels I got an email with my schedule, and a little note that basically said, “by the way, you will be going to Sóc Trăng at the end of the month to teach at a local high school.” With no idea why this was happening, or what I’d really be doing, I was a little nervous but also excited. I’d never been to Sóc Trăng, a province in the delta, and I had never taught at an actual high school, since all of my classes in Can Tho tend to be at the center or CTU. So I was tentatively excited, but basically didn’t really think about it for about a week. As I’ve mentioned before, my normal class schedule is pretty light. I teach in the evenings and sometimes on weekends (although I try to avoid that, since those are the kids’ classes, and I’m not exactly a kid person). So life went on as usual, and I heard snippets about the trip. Eventually I found out that I was being asked to teach two full days of high school English classes, and then help with some sort of party/assembly. It sounded like a big jump, going from a 12-hour work week to three 8-hour days, but I guess that just stresses why I really couldn’t complain, haha. Somewhere in the mix Peter was asked to go as well, and by the time we were to leave we had a general idea of topics to teach, but no idea what level the students were at. This was exciting, but also not ideal. I’ve learned over the past year that I really do work best within some sort of framework, and this whole, “do whatever you want!” thing isn’t really for me. But when life gives you lemons, you do what you gotta do. On the day we were meant to leave, a group of four students came all the way to Can Tho to pick us up, then made the 1.5 hour drive back with us. 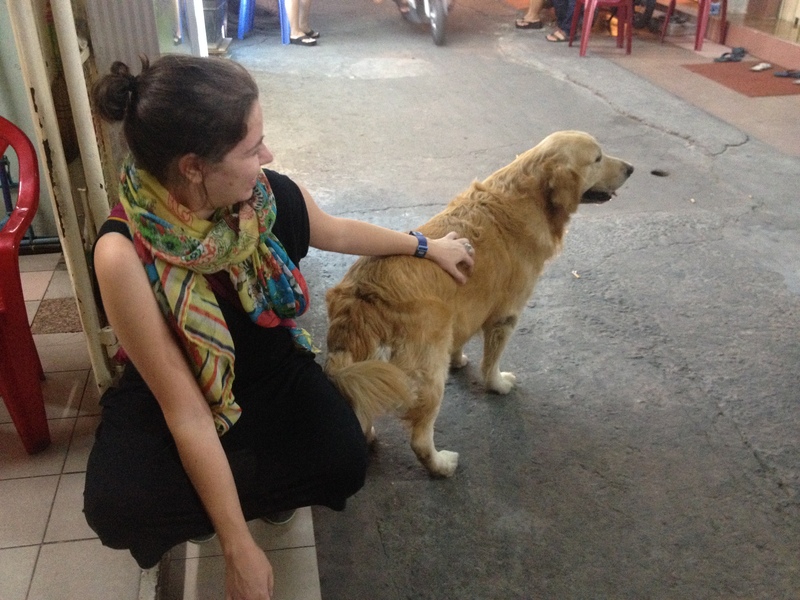 We chatted a bit, and when we arrived in Sóc Trăng they took us out for what they called, “stinky soup,” or bún nước lèo. It’s a Sóc Trăng specialty, and it’s extremely similar to bún mắm, which is sold in a stand outside my house. I was a bit surprised to discover that I couldn’t smell anything when they brought out the soup, and neither could Peter. We must have gotten desensitzed after living with the bún mắm smell (which is a bit surprising, considering when I first moved in I couldn’t stand the smell, and refused to eat at the stand). In any event, the soup was very good. The alleged smell comes from the fermented fish paste used in the soup, which is pretty strong, but tasty. After eating the students dropped us off at our hotel and asked if they could come back later and take us out to the “Freshwater Lake.” We were tired, but decided to go out and see the town. 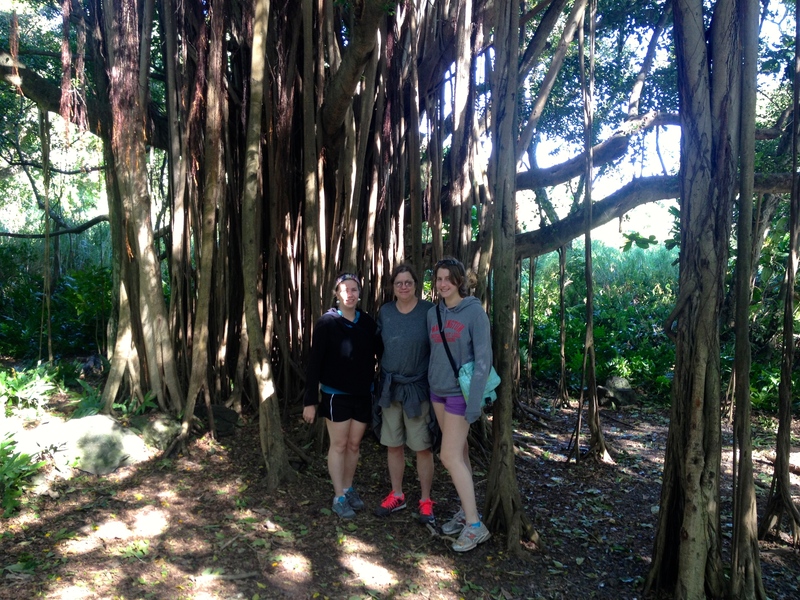 We walked around the lake and drank sugar cane juice, and the students were really sweet. Their English was waaaaay better than we were expecting, but hanging out with high school students was really testing my conversational abilities and pop-culture knowledge. We managed, but I went to bed that night feeling old and out of touch. The next day the students came by to take us out for breakfast at 6:30am. I was not particularly enthused about waking up this early, but the students were really sweet, and the food was tasty. We then got to the school and found out that, since we were teaching 2nd period, we had about an hour to sit and wait until we did anything, then an additional 30 minutes to wait while the students had a breakfast break. We were a bit perplexed as to why we got breakfast so early when we didn’t really need to be at the school until 9am, but later found out that the school was taking care of all our meals, and the students volunteered to go out with us. Since class started for students at around 7am, they had to take us out early. While our hotel was only a 5 minute walk to the school, they students and staff felt that we would either get lost or seriously inconvenienced if we had to walk on our own, so I think starting early also gave the students enough time to pick us up on their bikes and motorbikes. Peter took the first class of the day, and I sat in the back with the Vietnamese teachers and observed. Talking with them I realized that the schedule they were using and the one we had been given were different, which meant a bit of maneuvering of materials and improvising introductions. In the end everything worked out, and I sat back and observed for the morning. We had lunch with the students and a quick rest before I returned in the afternoon to teach two classes on the environment. 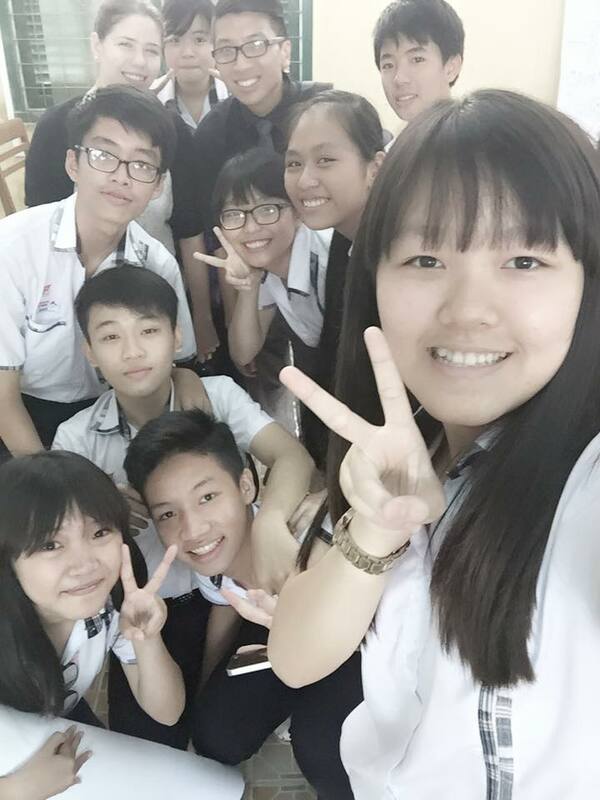 It was a bit odd, since I was given no materials and had no clue what the students already knew, but their English skills were better than I had been led to believe, and they were generally enthusiastic and fun. 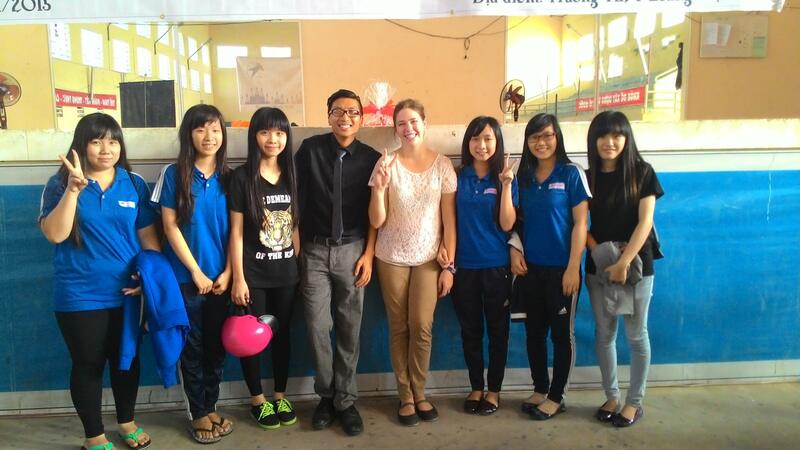 Peter and I were the first foreign teachers to ever visit their school, and everyone was really excited about it. After every class (and often during the class as well) students would ask to take selfies or have photos taken of us, or they would ask for our facebook info. By the end of the weekend my face hurt from smiling, and I had over 200 new friend requests. The students would post pictures on Facebook taken in the middle of class, and write statuses about Peter and me, that they knew we could see because they friended us. One student posted something like, “here is Peter’s Facebook, and Jessica’s. Add them!” All of it was a bit overwhelming, but clearly well-meant. That night we went out with students again for dinner, and again to the lake! It’s pretty much the only thing to do in town… This time they went for the carnival rides, which I declined to do. They were so insistent that I ride a ride that eventually they wore me down and I rode the baby roller coaster. My aversion to rides still stands, I did not find even the baby coaster fun. Thrill-seeking coaster-lovers, I will never understand what you get out of this. That sinking stomach feeling? Not so fun. But hey, to each his own, I suppose. The next day was early breakfast again, and then Peter taught two morning classes. I asked if I had to be there, and they said yes, so I sat through the first class. I was clearly falling asleep, which is not good teacher etiquette, so I snuck off back to the hotel to nap before lunch. I was a bit nervous about my afternoon classes, since the topic was “women in society,” and I had no idea where to even start. 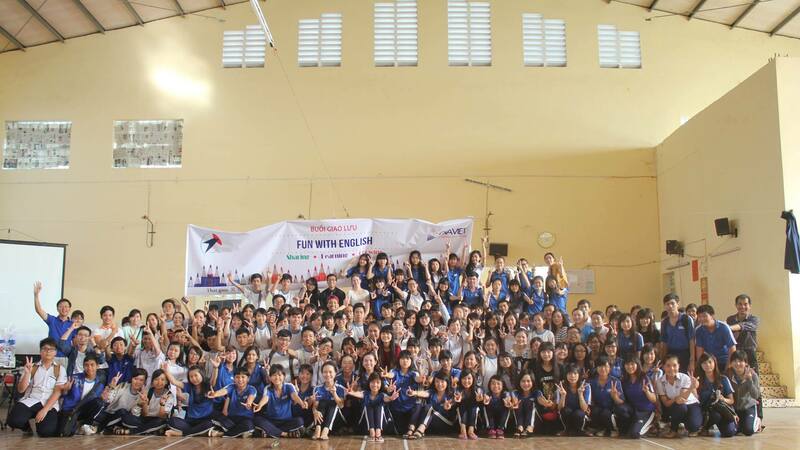 Also, the first class was a combo of two classes, meaning it was over 50 students in one large room. I had to use a microphone to be heard. The classes went alright, but I really wish I had done things a bit differently. Oh well, live and learn. 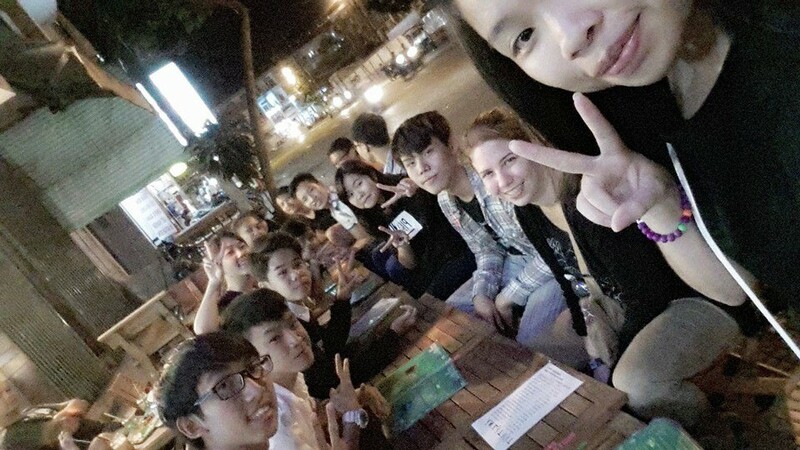 Our final day in Sóc Trăng was a Saturday, which is still a school day in Vietnam. Since nobody had mentioned breakfast to us the day before, we decided to sleep in til 7. Such a luxury! After finding our own food we went to the school to teach two project-oriented classes. 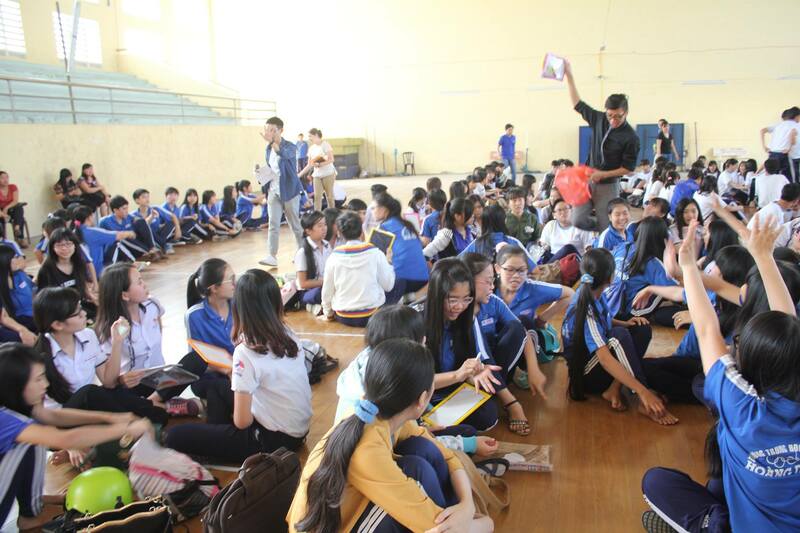 These were pretty fun, since the students just made posters talking about their favorite bands or discussing the differences between Vietnam and other countries, then presented to the other students. In the afternoon we met up with other staff from our center in Can Tho for the assembly, and generally sat back and observed the games and activities. At one point they were doing English trivia, and the students who were eliminated could be brought back into the game if they got teachers to sing for them. Peter and I were asked to sing, and we agreed, but thankfully another teacher got to the mic before us and we were spared that particular embarrassment. By the end, however, I still had a pretty silly role to play. I got up and tried to teach the students the “Cha Cha Slide,” which I can’t even remember how that was agreed on, but I did a horrible job of teaching it. Pro tip – if you’re going to teach a dance, take the time to really learn it ahead of time. I assumed that I knew it, and only practiced once, which was a huge mistake. The students were quick though, and picked it up just fine. In the end it was pretty fun. You can see it for yourself, in all of its embarrassing glory below. At the end of the event the students presented us with lots of gifts, including tons of banh pia (durian cakes), which are a specialty of the region. I think we ended up with a lifetime supply… Anyway, it was then time to make our way home. We were exhausted, but that day our friends were hosting a “beer olympics” party, which we thought was for another friend’s birthday. So we dutifully showed up, only to find it was not, in fact, his birthday party, just American style beer games. So that day I went from high school to college, and by the end of the night I was exceedingly glad to no longer be a student. 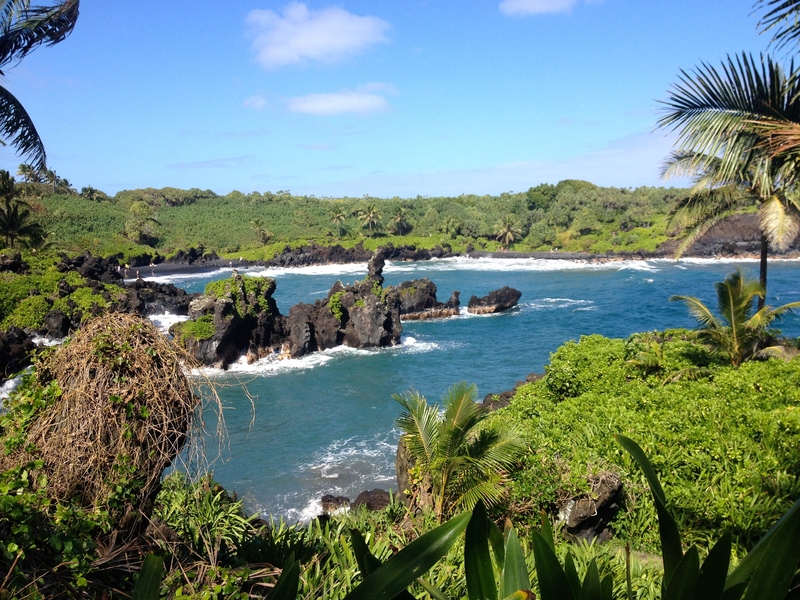 And now, FINALLY, we have reached the final stretch of my winter travels, my family trip to Hawaii. It has taken me far too long to write all of this, and I really appreciate everyone being patient with me and my turtle’s pace. Where I left off last time, Annin and I had just left Cambodia and flown back to Ho Chi Minh City. We met up with a group of my friends who also happened to be in the city, and all five of us had decided to cram into a hotel room for the night. And here my family is absolutely right to be thinking, “ahh, to be young and broke,” which is pretty much why it happened. And also because my friend’s friend works at the hotel, and was cool with looking the other way as we squished into the room. Anyway, that night we all went out for dinner, drinks, and dancing. One friend promised to take us to a club that played hip hop, but after about an hour and a half of techno we gave up on this hope and crawled into bed, sometime in the wee hours of the morning. 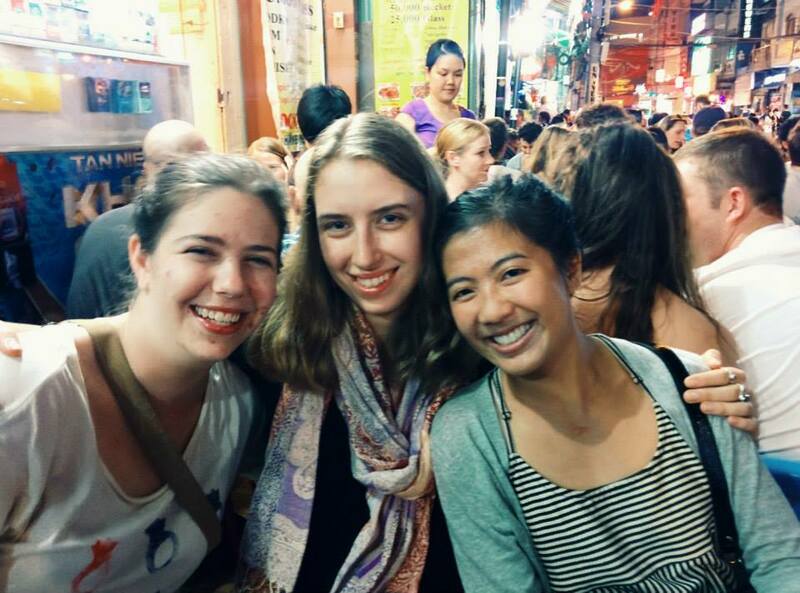 The next day we all went out for pho, then Annin, Selina and I set out to find the Saigon Flea Market, which is held 2x a month in district 7. None of us had ever been to this district, and it turned out to be a bit of a trek. Once we arrived I felt like I was in a completely different city – District 7 is where all of the mega-wealthy Saigoneers live, and so it’s filled with fancy expensive shops and big buildings. This was all a bit of a surprise for us, and going into the market I wasn’t quite sure what to expect. But there was no need to worry, it ended up being a pretty cool place. Lots of boutiques and local artisans were selling everything from clothes to macarons, and it was really cool to see that this sort of artsy event was available in HCMC. After the market I started feeling the effects of a night of drinking, and suddenly the thought of 12 hours of travel looked downright gruesome. But, with no way out of it I downed some aspirin, hugged Annin and Selina goodbye, and arrived at the airport too early to check-in for my flight, which was then delayed an additional hour. Travel tip for anyone traveling in Asia – avoid all airlines with the word “China” in them. They are probably cheaper, but will inevitably be delayed. But moving on, it was really great to be reunited with the family, and we spent the week doing the relaxed resort thing: shopping, sitting by the pool, and day-tripping. 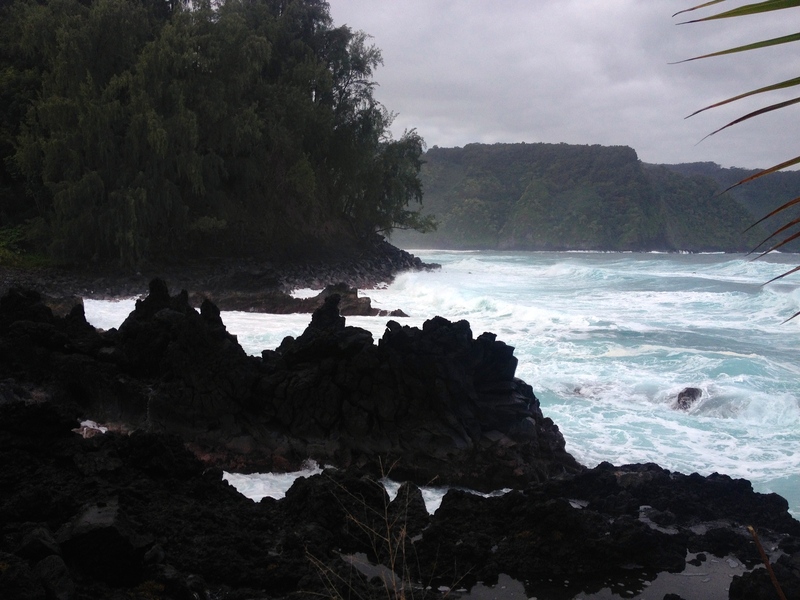 Our most eventful day was probably the tour of the Road to Hana, a twisty crazy road that winds around the island and is known for beautiful views. The scenery was indeed gorgeous, but the day was a bit marred for me by the guide, whose colorful commentary managed to be both racist, sexist, and generally uninteresting. By the end of the day I had given up on him, preferring instead to put in my headphones and use music as my guide to the scenery, which made for a much more pleasant experience. But even so, after 12 hours of winding, bumpy, tiny roads, everyone was ready to go back to the hotel. Otherwise the trip was quite lovely. 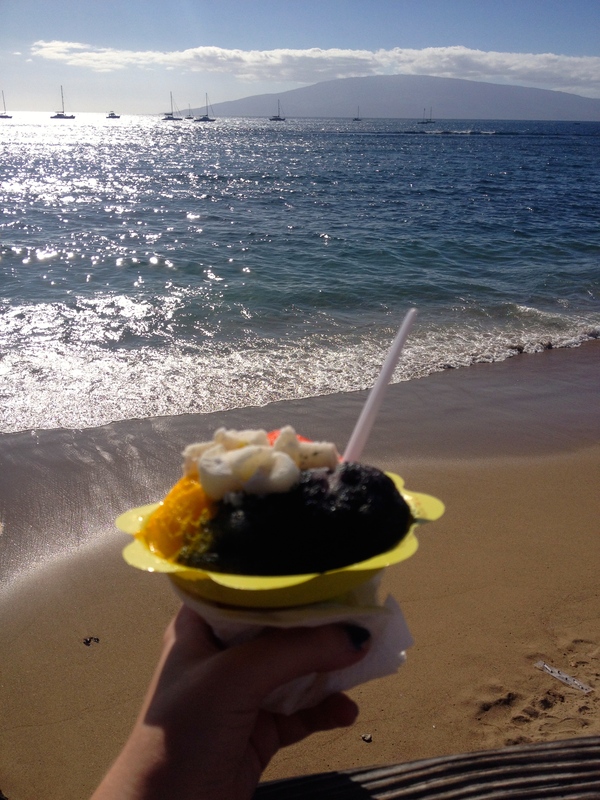 We spent time in the town of Lahaina, had delicious shave ice and Korean tacos, attempted a day of hiking (which really didn’t work out, but was fun anyway), and I got a lot of quality shopping in, so you know I was happy. The family also tried a fresh coconut for the first time, and learned very quickly that they much preferred the sugary variety found in a pina colada to the real thing. After a week of fun in the sun it was time for me to say farewell to the family and begin the trek back to Vietnam. It was sad parting with everyone, but, if things fall into place, I’m hoping it won’t be too long before I see everyone again. I had worked it out so that when I left the family, I still had one day in Honolulu to spend with a friend and fellow Pacrimmer. 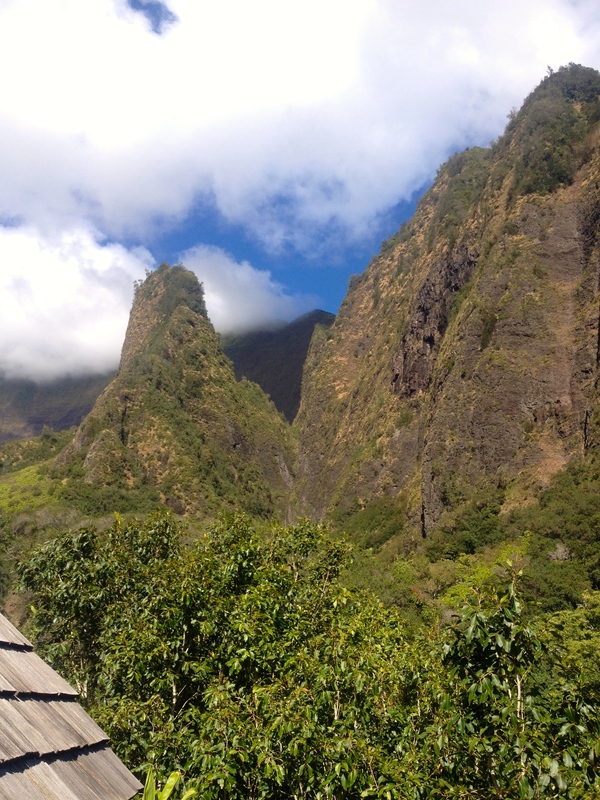 We spent the day driving around the island and I got a good feel for the absolute chaos that is Oahu traffic. Drivers in Vietnam may be crazy, but I’ve never waited in traffic for more than 10 minutes. But here, we sat on the road for probably an hour, for a stretch that otherwise would have taken 10 minutes. Just… wow. But really I didn’t mind, since the Island was beautiful, and I had a great time catching up with Erin. We ate some AMAZING Korean and Japanese food, I met her adorable dogs, and had avocado bubble tea (which should really move to the mainland, asap). At the end of the day Erin dropped me off at the airport, and I made the long journey home. On both flights I was seated next to babies, because the universe knows that even on a good day that’s my idea of hell. I think the flight attendant on plane #1 saw the sheer panic in my eyes when I discovered I would be sitting next to two tiny babies for a 11 hour flight, and quickly offered to reseat me. Even though it meant giving up my aisle for a middle seat I jumped on the opportunity, and the mother seemed happy to have extra space to stretch out. 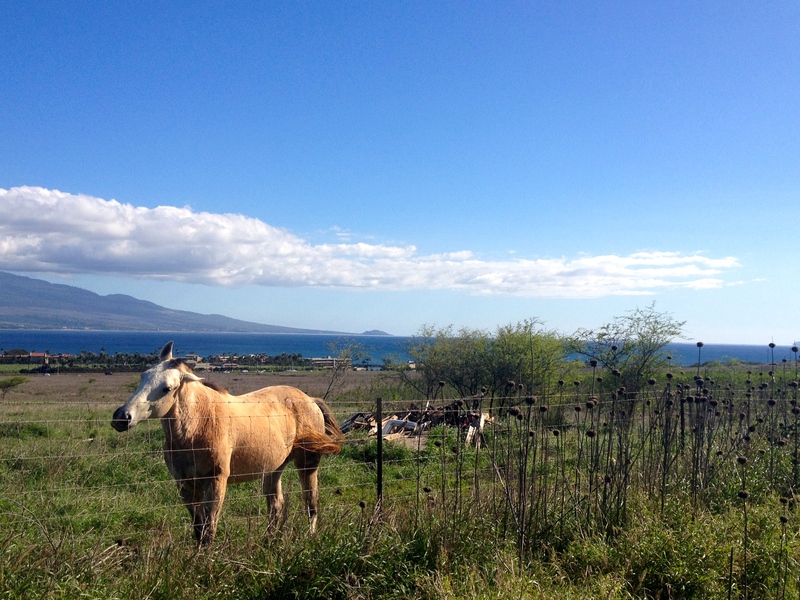 Failed hike # two was just a flat dirt road, past a bunch of horses. But hey, it was still pretty. In the end I made it safely back to Vietnam, and I realized I really was really happy to be back. After almost three weeks of travel, it was great to be home again.